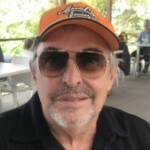 Irish musician, Beatle-nut and radio presenter Mick Francis has written a wonderfully detailed, interesting and positive album review of ORANGE. So much time and effort must have gone into writing it and we can’t thank him enough. Get his book ARTPOP: The Roots & Fruits of Sgt. Pepper’s Lonely Hearts Club Band! Nothing much rhymes with ‘orange’. Try it! It’s a lonely word in a lyric and you wont find it plonked into the rhymes of this most lyrically sophisticated and playful album. I initially didn’t at all like the title or the cover, as I felt that they didn’t represent the depth and variety of content, which is more of a rare double rainbow cast against a stormy sky which clears with each and every listen to ORANGE. I’ll explain the reasoning behind the title, but first let’s go back and back and back to 2014. 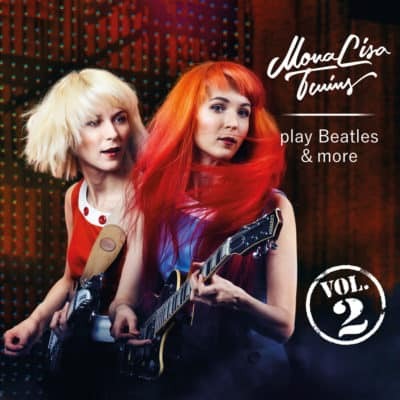 I was introduced to the MonaLisa Twins in Dublin, when they were guests on the Beatle Bug radio show. They were bright-eyed teenagers (despite the cough and the cold), buzzing on life and music while promoting their current album, The MonaLisa Twins Play Beatles and More. One listen to their covers of ‘Revolution’, ‘This Boy’ and ‘Blackbird’ alerted me to the fact that these girls loved this music and had studied The Art of Not Mucking It Up. They were also still promoting their debut album, When We’re Together, which featured startlingly mature songs, such as ‘The Wide, Wide Land’ (written in tribute to their grandmother who had Alzheimer’s) along with Beatlesque rockers and harmonic ballads. I was hooked. Donovan loved it. Pete Noone of Herman’s Hermits loved it. Albert Lee loved the album, as did John Sebastian of the Lovin’ Spoonful. They also found time to record in Abbey Road Studios, tour with Steve Harley & Cockney Rebel, perform at Glastonbury, create dozens of top quality, fun music videos to their original songs and covers (which have attracted almost fifteen million views on YouTube) and write new songs which – in one album move – have leapfrogged them from the equivalent of the Beatles’ Please Please Me album to something as marvellous and timeless as Rubber Soul. Pick your jaw up from the floor and let me try to explain, although a listen to ORANGE would explain everything. ORANGE opens with the sound of a primitive radio signal tuning into the words, “No one can clearly foresee the future” followed by snippets of classical and ragtime music as the dial is turned like a faulty time machine dropping in and out of the 20th century to stall on the speaking voice of John Lennon in 1980. The past is ‘The Future’ before a “1, 2, 3, 4” count-in (Please Please Me, Revolver…) announces the NOW and lands us safely in the lap of the ‘No More Worries Company’. Just one minute into the album we are made acutely aware that this is going to be a fun and a most unpredictable listening experience. The Twins’ father, Rudolph Wagner wrote the bones of the song long before they were born (then titled ‘No More Working Company’) and it had remained unheard on a cassette as a rough demo until his curious daughters discovered its potential. Dad, an accomplished musician himself, also produced ORANGE and co-wrote many of the songs. As opening songs go, ‘No More Worries Company’ is an aural charmer, dressed in brass, banjo and honky-tonk piano for the music hall of the 1920’s. The audience loves the performance. We know because they can be heard – an old trick used to great effect by the Beatles on ‘Sgt. Pepper’s Lonely Hearts Club Band’ and that song’s reprise. Adding to the nostalgic vibe of the opening song is the sound of a 78 RPM vinyl scratch in the mix, while another charm of the track is the Twins’ subtle Austrian accent on the phrasing of some words (hey, it worked a treat on recordings of Bjork, the Cranberries… Don’t lose it, girls!). If ‘No More Worries Company’ was any more up-beat and playful your sound speakers might just pump out confetti and streamers at the song’s conclusion. ‘Once Upon A Time’ takes us into the hazy shade of the Summer of Love as lazy, jangling electric guitars evoke some of the Twins’ ’60’s influences. The song was purposely tailored as a paisley magic carpet for John Sebastian and his blues harp to soar on, as Mona and Lisa harmonise, singing about the Age of Aquarius and the season of the witch. This is the second song on the album which name-checks a Beatles song, while the lyrics also give nods to Neil Young and Pink Floyd. It’s another sermon of positivity and a call to care for one another in this day and age. In melody, sentiment and quality, ‘Close To You’ (the earliest written song on ORANGE) is somewhere between the Beatles’ ‘This Boy’ and ‘I’ll Follow the Sun’. The key melody line of the verses is actually not dissimilar to the key chorus line of ‘World Without Love’, an early Lennon-McCartney giveaway to Peter & Gordon, but ‘Close To You’ is the more attractive song, expertly performed and exquisitely produced, bringing to the fore the sweet lushness of the Twins’ voices in harmony. ‘It’s Alright’ is a refreshing splash of orange onto the clockwork of recurring feelings of self-doubt. This is power-pop at its best. The Bangles or the Boo Radleys would have had a hit on their hands with a song such as this, which wouldn’t have been out of place on the Beatles For Sale album. Just try not to tap your toes to it – impossible. ‘It’s Alright’ – instantly likeable – would have made for a fine first single from the album, but instead the Twins released the following track, ‘Waiting For the Waiter’ – something completely different and unexpected – a confident choice, but a song which took its time to grow on me. It is now among my favourites on ANY album, and this track also features the welcome howl and swagger of John Sebastian’s blues harp, taped in Woodstock. There is absolutely nothing like this on mainstream radio today – a raw, sleepy blues number with a seductively impassioned lead vocal by Lisa which should make any hot-blooded waiter hotfoot it to the table and leave a tip with the change (check out the video on YouTube). However, the singer and the song aches for a more meaningful and durable kind of change, exhausted and frustrated by those among us waiting for change and doing nothing positive to bring it about. CHANGE is a vast word. Social, political or environmental change? Mood change? Job change? A change of socks or hair colour? Everything changes when we refuse to wait. Mother Nature is not a waiter. Life doesn’t wait for waiters. Life moves on and leaves the waiters behind. The MonaLisa Twins don’t appear to wait for life or circumstance to change. ORANGE is the triumphant result of their embrace of life and changes, facing them head-on and learning – developing into two incredibly talented and smart twenty-three year old women with their eyes on the prize – the fruits of their work – with their hearts in it for a love of what they do. The thing about ORANGE is that, musically, it doesn’t care a toss about what is currently in style or what is hip on the scene this season. As the following song states, the Twins no longer care what is “in” or “out” – they care about crafting the best songs, which are influenced by the best songwriters the world has known. In the case of ‘In It For Love’, this song could have been a gem among a catalogue of work by the likes of Carole King. Someone please resurrect Ella Fitzgerald and Nina Simone to do a duetting cover of the song, although the Twins would still do it better. This is classic songwriting, elegantly produced (admire the subtle and suitable drumming) and it is Lisa’s favourite track on the album. ‘Count On Me’ is my current favourite (although that tends to change day to day). This is a stripped back acoustic performance which parks the heart by a glowing campfire, under a starry night sky and within the embrace of a loving hug. The production and arrangement is again most suited to the song, with flutters of perfection on acoustic guitars gelling with minimal use of strings which don’t smother the glow or intrude on the intimacy. ‘Sweet Lorraine’ is perhaps the weakest, or most contrived track on the album, and it could have been a standout song on a Hollies or an early Queen album (‘Killer Queen’ anyone? ), which says a thing or two about the level of quality found on ORANGE. The arrangement could maybe have done without the trumpet solo, although the brief chorus of singing children is a cute decoration (reminiscent of ‘Those Were the Days’). Like ‘Once Upon A Time’, ‘Club 27’ is another tribute to Mona and Lisa’s musical heroes. Here they tip their hats and stomp their boots to Jim Morrison, Jimi Hendrix and other rock stars who died aged twenty-seven, now raising hell in heaven. Pounding toms and slashing electric guitars set the tone for the rocker of the album. They could have totally grunged up the sound and shrieked out the words, and that would have worked, too. I’ve seen the Twins perform live many times in Liverpool and when one first hears Lisa’s guitar howl and Mona’s voice growl as they rip into a rocker, the immediate instinct is to take one step back before taking two steps, four steps forward toward the stage. I’ve no doubt that ‘Club 27’ will go down a storm in a live setting but the record is somewhat lacking the blur of the stage lights, the sweat on guitar strings and the steam of a crowd to set the band on fire. I’m sipping from my ORANGE coffee mug as I write this. If I wanted, I could be sitting on an ORANGE beach towel, wearing an ORANGE baseball cap and t-shirt. 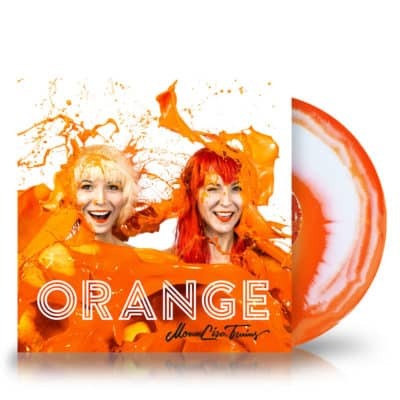 All sorts of fab merchandise is available at monalisa-twins.comincluding vinyl copies of the album, each disc of which is individually designed – a unique treasure for any vinyl lover. What I really needed was a box of ORANGE tissues after listening to the closing track on the album. ‘Still A Friend Of Mine’ is Mona’s favourite song among the dozen and it’s also a big hit with fans currently absorbing ORANGE. The song is a stripped back piano ballad (similar in chord structure and aura to Bob Dylan’s ‘To Make You Feel My Love’) which breathes slowly enough to leave the listener breathless at its emotional impact. This is an ode to the stubborn rebels among us who speak their minds and “keep the naked emperors from running wild, so we might start to talk about what we don’t dare to see” – In essence, our friends who splash a little juice in the face of a clockwork world. The Mona Lisa Twins’ album is the spiritual, bright and blooming counterpoint to the dull, monotonous noise of the ever-ticking clock that so many of us march to as we battle our way through the material world, without a moment to stop and smell the roses. 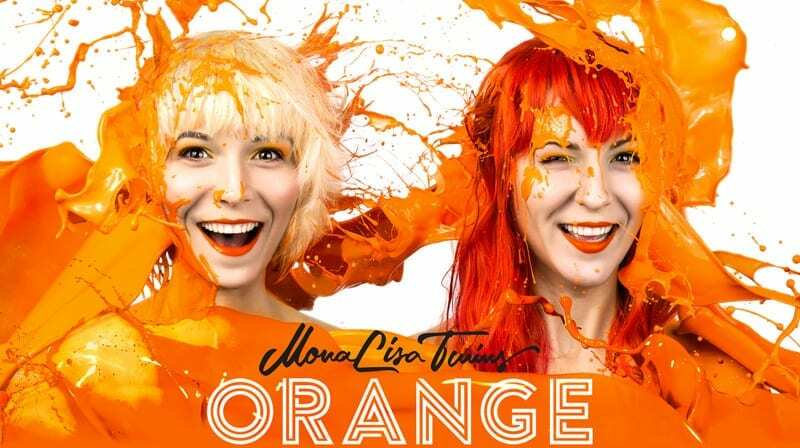 The Twins were also keen on such a title because, if the colours of their hair were to be mixed they would create orange! Also, orange is the opposite of blue on the colour wheel. Damn cool album title! If you are feeling blue you need to flip the mood to ORANGE and leave it all to the No More Worries Company. If you at all admire even some of the influences and comparisons mentioned in this review then you need to hear this album. No more turning of the radio dial in search of something of substance and beauty to stir the soul, warm the heart and make you want to dance and sing along. The future has arrived and it is ORANGE. Don’t be the waiter. The change is right here! After over a year with Orange, listening to it day in day out, one thing is very clear, I never tire of it, in fact I feel like I’ve matured with it musically, and as time goes on I appreciate and treasure it more. The beautifully sung ballads “Count on Me”, and “Still A Friend of Mine” were my instant favorites from first listen. The beauty of their singing broke new ground for me. Next after a little while “Sweet Lorraine” came down on me like a brick wall listening to it one day. It evokes the kind of feeling I get when I hear Beatles songs like “Penny Lane” , “Eleanor Rigby” or “We Can Work it Out”, just supremely elegant! I am captivated by the melody and harmony first, and then comes the lyrics, so “Sweet Lorraine” is the tops in my books among the songs in Orange. I think it is the strongest song on the album artistically for me, maybe on par with “Still A Friend of Mine”. “Close to You” followed by “In It For Love” have become such sweet sounds to the ears. Seeing the acoustic version of “In It For Love” posted in the Duo section of the MLT Club pushed it over the top for me. The guitar lead in on both songs really hit’s a chord with me (excuse the pun), and it beautifully persists throughout the songs with the wonderful vocals. While the lyrics of a song often come second to me after the melody, the lyrics in Close to You really touches and moves, and is one of the best in the album. From the very first track, “The Future”, positivity, hope, and the mysteriousness of life, are a consistent theme throughout the album, and songs like “No More Worries Company”, “Once Upon a Time”, “It’s Alright”, “Waiting for the Waiter”,”That’s Life” capture that positive feeling and hope beautifully and poetically. With Orange, I get something new and fresh with every listen. If that isn’t at the heart of “ART”, I don’t know what is. Mick Francis provided a great review of Orange here, and I agree whole heartedly with him that Orange is “as marvelous and timeless as” the Beatles “Rubber Soul”. Coming from a Beatles fan and expert of his caliber, that is quite a complement for Mona and Lisa indeed! Thanks Mick! Wow! That is a fantastic review from Mick. He certainly knows his music. One thing I've found consistent about MLT's music is that you never tire of hearing any of it. With some songs you are instantly hooked, while others take time to grow on you. I was instantly hooked with 'It’s Alright', while 'Waiting For The Waiter' took time to grow on me. The same can be said for 'Sweet Lorraine' which I at first considered to be a little light weight in the company of the other songs but now appreciate there is much depth to the narrative that is disguised by the whimsical nature of the tune. Lorraine, although a flawed person (like most of us), is quite a sympathetic character, one we can feel for. As for "We’re run by maniacs by maniac means, And only love will set us free", these are lines from the sublime 'Still A Friend Of Mine', not 'That’s Life'. However, this oversight doesn't detract from Mick's very astute and thoughtful album review. Thank you for sharing your thoughts. Your review has certainly enhanced my appreciation of this wonderful album. It is a high benchmark the Twins have set themselves, but considering their career progression to date, I am confident they will be up to the task with their hugely anticipated third album of originals, to be released this year. What a remarkable review! Like many others, I too am truly hooked on the infectious melodies, delightful harmonies, and wonderful instrumentation of ORANGE. Not to mention the massive leaps and bounds that their music has taken lyrically as well. And if this 23-year old Joni Mitchell and St.Vincent-loving listener can be bowled over so completely by it, it absolutely deserves to be heard by pretty much everybody else around, not just Beatles fans (although getting more Beatles fans to listen to it couldn't hurt). ORANGE holds up to multiple listens and only seems to get better each time. I reviewed the album the day it came out after listening to it about five times and it now feels like such an embarrassingly superficial review that barely scratches the surface of what makes it so brilliant. I'll probably take the time to update it soon. I will say, though, that Sweet Lorraine is easily one of my absolute favourite tracks on here. It never sounded contrived to me and the trumpet solo really reminded me of Penny Lane (and I still wonder who played it. Mona?). There is a real "cinematic" quality to its lyrics that makes it jump right out and command your attention. Those verses are absolute gold and I adore the way it's delivered. If I had anything constructive to give, I'd only say that Once Upon A Time does come across as slightly wordy and could have done with just a little bit of editing (even though I live for references like that). I recently had a listening party with a few friends of mine who mostly listen to mainstream, more contemporary-sounding music and I threw in some ORANGE between bursts of First Aid Kit, Maggie Rogers, and Laura Marling, and they really loved Count On Me, Still A Friend Of Mine and Close To You in particular. If I had to pick a personal favourite though, I'd say it would be a five-way tie between In It For Love, It's Alright, Club 27, Sweet Lorraine and That's Life. I live thousands of miles away from any place they would potentially consider performing live at but you can bet I'll be there to catch at least a show or two if they ever go on tour next year. Watching them perform Club 27 alone would be worth the price of the flight ticket. ORANGE really is hands-down one of the most consistently listenable and catchy albums I've heard all year across many genres. All the cynics who yearn for the "good old days" and lament that there just isn't any good music being made anymore just need to dig a little deeper and know where to look. To them I'd say, look no further! The sixties-inspired sound makes it a no-brainer of an album to get for fans of the era, but I'd hate for it to be relegated to merely that category. It's so diverse, well-crafted, and overwhelmingly good that anyone, young and old, with an open mind and an ear for music will truly love it.